You can use your iPhone to track weather forecasts in the places that interest you. Weather is a simple application on your iPhone that provides you with the current weather forecast for the city or cities of your choice. By default, you see a six-day forecast for each chosen city. 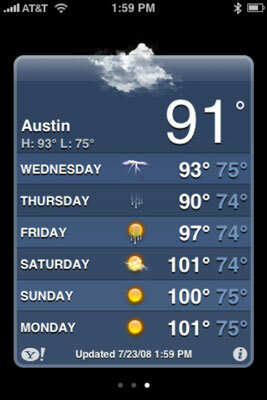 View the six-day forecast for Austin. To add a city, first tap the i button in the bottom-right corner. Tap the + button in the upper-left corner and then type a city and state or zip code. Tap the Search button in the bottom-right corner of the screen. Tap the name of the found city. Add as many cities as you want this way. To delete a city, tap the i button in the bottom-right corner. Tap the red – button to the left of its name, and then tap the Delete button that appears to the right of its name. You can also choose between Fahrenheit and Celsius by first tapping the i button in the bottom-right corner and then tapping either the ˚F or ˚C button near the bottom of the screen. When you’re finished, tap the Done button in the top-right corner of the screen.